Who Cares? is a professionally bound lap book with colorful and inviting images throughout its 225 pages. In addition to the book itself, you will also receive 2 Cd's with 12 meditations which follow the chapters and support you on your journey. 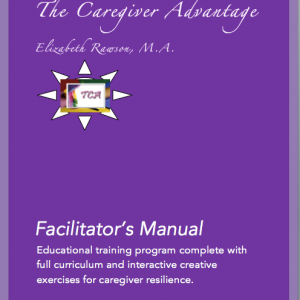 This guidebook will be your companion along your caregiving journey. You will find “mini-tips” sprinkled throughout to encourage you to begin to take care of yourself, access the services available in your community and teach you ways to ask for the help you need from family and friends. Meditation CD's: 12 individual meditations (which follow the chapter points in Who Cares?) on 2 CD's . Elizabeth guides each caregiver in finding moments of self-praise and acknowledgement while delightful native flute accompanies her voice. 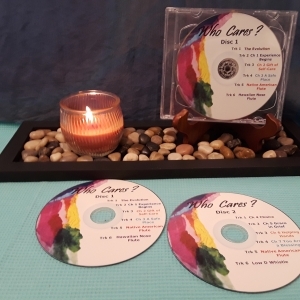 These Meditation CD's are ideally suited for guiding the listener along their self-care journey. 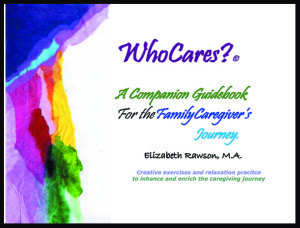 30 Minutes of Consultation/Caregiver Coaching with Elizabeth. 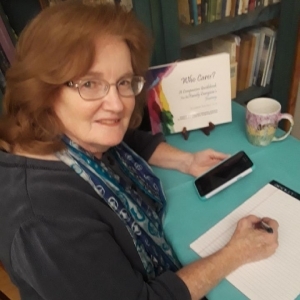 60 minute Consultation/Caregiver Coaching with Elizabeth.